Want to know if that important email was actually read -- or ignored? These Gmail tools can help. When you send an email, it can sometimes feel as if you're tossing it into a black hole. Did your recipient get it or was it waylaid by a faulty spam filter? Was it ever read or did it get lost in the day's mass of messages? The only way to tell is via email tracking, which lets you know when your email is opened by its recipient. If you're a Gmail user, you already know that Google's service doesn't have email tracking. But if you use it through the Chrome browser, there are several services that can track your sent emails. For this roundup, I chose the six that, according to the Chrome Web Store, have the highest number of users: Bananatag, Boomerang, Mail2Cloud, MailTrack, Sidekick and Yesware. Most of these services include tracking as part of a larger suite of enhanced email functions. For example, some also let you schedule an email to be sent automatically on a date and time of your choice. Another popular feature lets you hide a received email until a speciIfic date and time (when you're better able to deal with it). Many of these services can also tell you if the recipient clicked a link that you put into the email. For this article, I've focused mainly on these services' tracking capabilities: What features do you get for free and what more do you get when you pay for a premium plan? How well does the service's Chrome extension integrate with the Gmail user interface? How will the service notify you when the recipient has opened your tracked email? And finally, is this the type of service to consider if you only need to send a tracked email occasionally? Or might it be useful if you need to track the response rates of a group of emails in greater detail, such as through a chart? Let's see what each service offers. Bananatag's user account page offers a statistical view of your results, including charts that illustrate the rate at which your tracked emails are opened. In addition to its Chrome extension, Bananatag also has an add-on for Outlook, and can work with other email client programs (which are configured to route email through the Bananatag SMTP servers). Along with tracking whenever a recipient opens your email, Bananatag can also keep count of the times a link inside your tracked email has been clicked. This service includes send-later, remind-later and send-recurring email functions. Bananatag adds a toolbar below Gmail's email composition toolbar that includes a blue "Track Email" checkbox. Just click this to mark it with a check, and the email you're writing will then be tracked once you click "Send." Bananatag will send you an email notifying you the first time (but only the first time) that your tracked email is opened, and will send separate email alerts each time the recipient clicks a link inside the track email. Through your user account page on the Bananatag site, you can get a nice statistical view of your results, including charts that illustrate the rate at which your tracked emails are opened and links inside them are clicked over a customizable period of time. 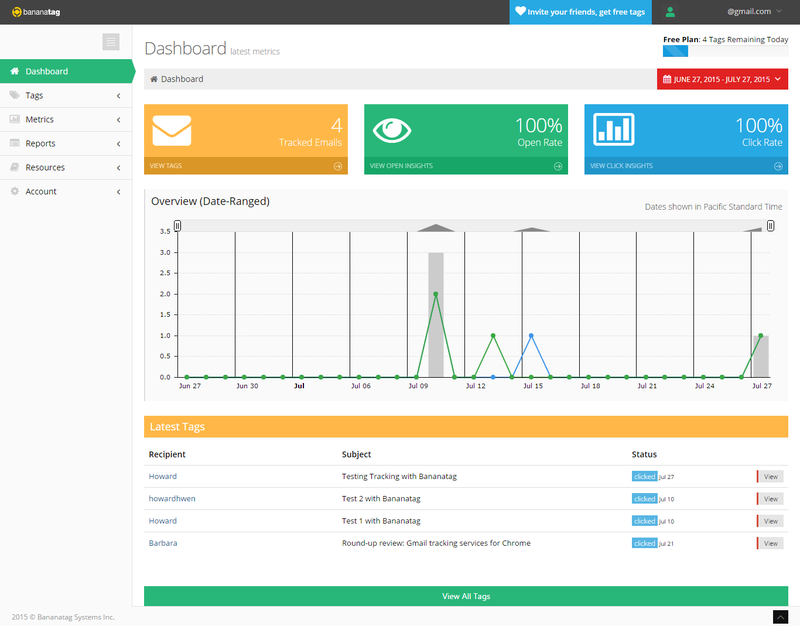 Tracking is free for up to five emails per day. After that, Bananatag offers two paid plans. For $6.25/month, you can apply Bananatag's features to up to 100 emails per day, while $12.50 per month (per user) raises this to 200 emails per day and adds team management features. There is a separate version that tracks and reports on internal emails within organizations; pricing for that starts at $250 per month. Subscribers also get more detailed information, including the geographic location (country, region, city) where the tracked email was opened or link was clicked and what kind of browser, device (i.e., computer or mobile) and OS was used. Bananatag's functions integrate into the Gmail UI very well. The charts on your user account page can help you gauge how effectively an email campaign is going, especially if you need to track how often links are clicked in those emails. If you only need to send tracked emails occasionally, the five-emails-per-day limit for free accounts could be more than enough. Boomerang adds a status bar to the top of each tracked email that keeps you informed of the number of times the email has been opened or a link has been clicked. This extension is the most popular of those covered in this article, approaching one million users. I suspect that Boomerang may have gotten all this love for its send-later and remind-later features rather than its email tracking, which has fewer capabilities than some of the others here (such as Bananatag). Boomerang appends a toolbar below Gmail's email composition window which includes an icon of a blue envelope with a question mark. Click it, and the following is appended to your email: "The sender has requested a read receipt. If you do not wish to provide one, click here." You cannot delete this notice (unless you decide not to track the email). 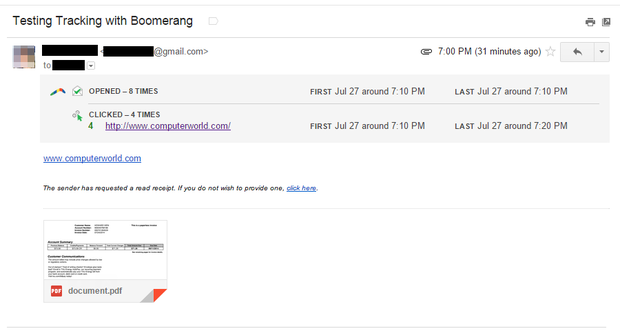 Like Bananatag, Boomerang will send you an email notifying you of the first time that your tracked email has been opened, but the service doesn't send you an email when a link inside your tracked email has been clicked. Instead, you need to check within Gmail -- Boomerang adds a status bar to the top of each tracked email that keeps an updated tally of the number of times the email has been opened and, if the email has a link inside it, how many times that link has been clicked. As mentioned, this extension has extensive send-later and remind-later features. For example, your email can be set to remind-later if the recipient does not click on a link inside the email, or if they do not open your email -- in other words, if the reminder deadline passes, the email reappears in your Inbox as if it were forwarded back to you. In addition, on your account page on the Boomerang site you can see a full list of all the emails you've set to be tracked, sent later and reminded of later. Details include how many times an email has been opened and the number of times any link inside it has been clicked. Boomerang tracking services are free for ten emails per month. There is an Android app and a mobile-site version of Boomerang; however, they can only be used to send tracked emails with the paid version. The three paid tiers start at $4.99 per month; for that amount, you can track an unlimited number of emails and add mobile access. For $14.99/month, you can track recurring messages from Gmail and Google Apps; while $49.99/month adds a variety of premium business features such as Salesforce integration. Being able to see opened and link-click counts at the top of a tracked email without leaving your Gmail site is really convenient. Boomerang's limit of ten free tracked emails per month will only work if you need little more than infrequent, personal use. However, if you need to send a lot of tracked emails -- such as a mass email addressed to several hundred people -- then at $4.99 a month for an unlimited number of tracked emails, Boomerang looks like a great deal. To have an email tracked in Mail2Cloud, you highlight Total Track, choose a time limit for how many days any files you attach can be downloaded, and then click the “Send” button. Mail2Cloud's most notable feature is that the files you attach to a tracked email can be set so that they can no longer be downloaded by the recipient after 1, 3, 7 or 30 days -- a handy feature for time-sensitive materials. The service also lets you convert an email to PDF (along with archiving whatever files are attached in their original format) and store it in Box, Dropbox, Google Drive or ShareFile. The Mail2Cloud extension inserts an aqua-blue button bearing the service's logo to the immediate right of the "Send" button on Gmail's email composition toolbar. To set an email to be tracked, you write your email first and then click the button. 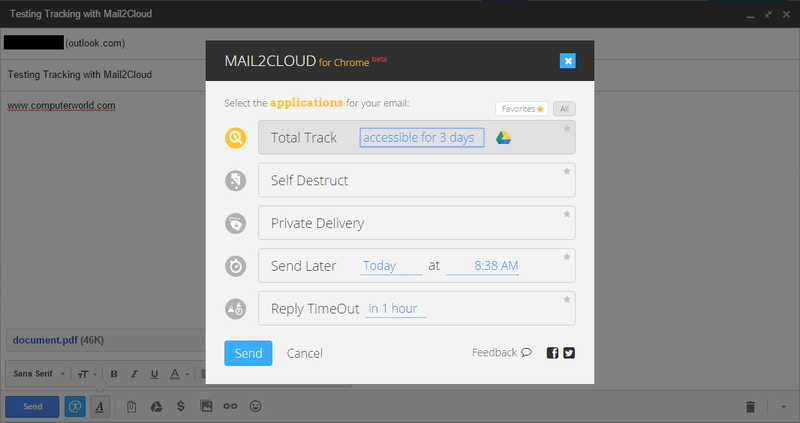 A panel opens that lists functions that the Mail2Cloud service can apply to the email -- for example, to have the email tracked, you highlight Total Track, choose a time limit for how many days any files you attach can be downloaded, and then click the "Send" button. The Mail2Cloud servers will then send you an email when the recipient opens your tracked email, when any link inside the email has been clicked (and it will give you the URL of the link) and when any attached file is downloaded. However, Mail2Cloud sends an email for only the first time that any one of these actions is done by the recipient. On the Mail2Cloud site, you can access a list of all the times that your tracked email was opened, what city the recipient was in when they did so, what kind of device they used to access your email, what links in the email they clicked, and what attachments they downloaded. Like Bananatag, Mail2Cloud also works with Outlook. Mail2Cloud offers a 14-day free trial that lets you use all of its features. After the free trial period has expired, Mail2Cloud is available for $8/month for individuals. A business plan offers the same features at $5/user/ month for 3 to 99 users, and there is an Enterprise plan available for organizations with more than 100 users. If you're sending a confidential business file and need to track and control its distribution, this is one option to consider. Only one other service I tested for this roundup, Yesware, tracks the status of attached files. Unfortunately, Mail2Cloud lacks a free option.